In order to prevent the mix from falling off the skewers, you should drain the juice out of the grated onion before adding it to the meat. Also the colder the mix, the better it will stick to the skewers. Divide the meat into 8 portions. Shape each portion as a big cigar. Thread each portion with a long metal skewer, press and shape again evenly. Place the skewers a few inches away from the grill coals. Turn constantly every 2 or 3 minutes each side, until meat is already cooked. 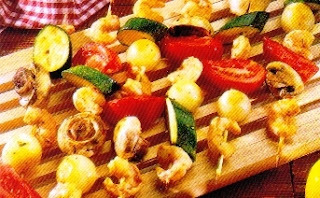 Take off the skewers and serve 2 in individuals serving plates. You can combine this plate with some of our excellent salads. Combine the butter, granulated sugar and brown sugar in a large bowl. Beat in egg and vanilla extract, set aside. Sift the flour, salt, baking powder and baking soda into a small bowl. Add the flour mixture to the butter mixture, beating continuously. Stir in the rolled oats and chocolate chunks. Onto the prepared baking sheets spoon tablespoonfuls of the dough, about 2 inches apart. 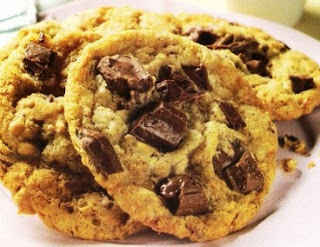 Bake cookies until lightly browned, more or less 10 minutes. Clean the lobster and chop it into pieces. Coat the lobster pieces with some corn starch and deep fry in very hot oil until 80% done or as soon as the shell turns red. Dish out and set aside. In a medium-high heat, heat up a large sauté pan or wok and add the melted butter. Toss in the chopped garlic, sliced onion and stir fry about 2 minutes, but before they turn brown. Add in the light cream/milk, bring it to boil, and then add in the fried lobster pieces. Lay the 4 pieces of cheese on top of the lobster and cover the wok on high heat and let it simmer for a few minutes or until the cheese melts and the sauce thickens. 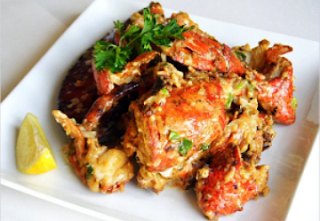 Stir and blend the cheese well with the lobster, add chopped scallion, salt and sugar to taste, dish out and serve immediately. Place the parsley over as garnish. 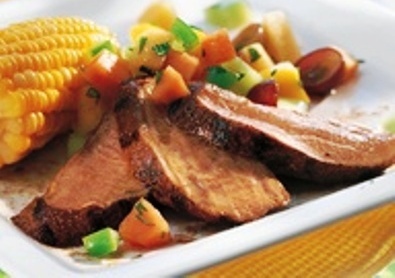 You can combine this excellent recipe with this other plate of our collection. 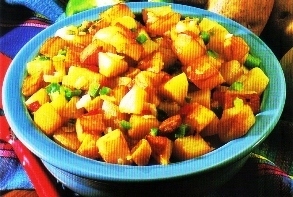 Peel and cut potatoes into cubes. Add potatoes to a large saucepan and cover with water. Add one teaspoon of salt. In a large skillet melt butter over medium heat. Add potatoes, onion, green bell pepper and red bell pepper. Cook everything, stirring often to prevent sticking, until potatoes are golden on all sides and slightly crisp, about 15 minutes. Add remaining salt and pepper. Serve by placing them in a wide, shallow bowl. Sprinkle over the parsley, chives or green onions. You can combine with some other recipes from our collection. Sprinkle chicken with lemon-pepper seasoning. 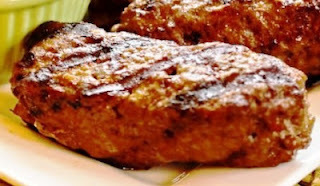 Drop it on the grill with red bell pepper, Italian zucchini and green onions. Cut the lettuce and place in large bowl. Cut cooked chicken into small pieces. Place chicken and vegetables over the lettuce. To prepare chicken for salad you can also use this another recipe of our collection and accompanying it with other of our recipes. Peel and remove the core of apples. Cut apples into small pieces. Sprinkle apples with lemon juice to prevent them from turning brown. 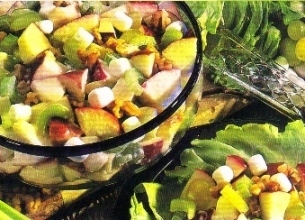 In a large salad bowl, combine apples, celery, grapes and nuts. In a small bowl, combine mayonnaise and salt. Add the mayonnaise mixture to large salad bowl. Cover with plastic wrap and place in refrigerator until serving time. To serve arrange the lettuce leaves on individual plates. Add the miniature marshmallows to the mix of salad. 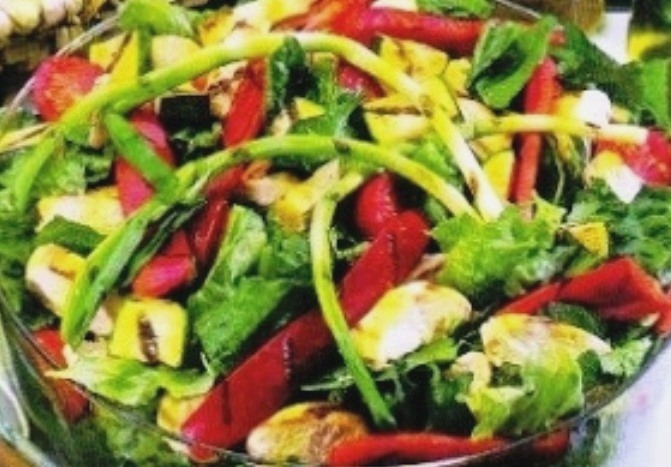 Using a big spoon of salad, serve the salad on lettuce leaves prepared. You can use this excellent plate to as a side dish of other dishes from our collection. In a large sauté pan cook the bacon over a medium heat about 6 minutes, or until crispy. Remove the bacon and drain on paper towels. Pour off all of the oil except for 3 tablespoons. Add the garlic. Season with black pepper. Sauté for 30 seconds. 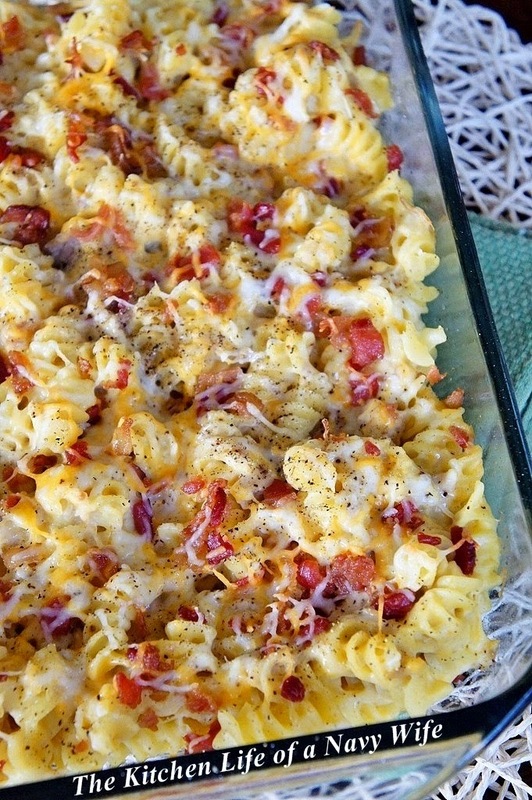 Add the crispy bacon and the cooked pasta. Sauté for 1 minute. In a medium bowl whisk the eggs and season with salt. Remove the pan from the heat and add the eggs, whisking quickly until the eggs thicken, but do not scramble. chopped parsley over pasta. Garnish with one parsley spring. You can combine this recipe with this other excellent plate of our collection. Place the breadcrumbs in a not too deep medium bowl. Add the dill, add pepper, add garlic powder, and process everything until fairly smooth. Into another similar bowl, combine mayonnaise and water. Dry the fish fillets using a towel paper. Dip the fillets in the mixture of mayonnaise and water. Pass the fillets by the bread crumbs covering them all over. 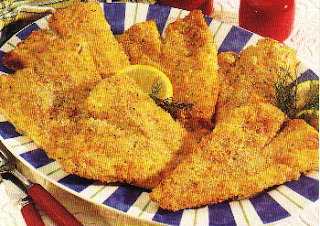 Place the fish fillets on the baking sheet, being careful not to touch each other. Serve with the lemon, and combine with this other plate and this one. Heat oven to 450°F degrees. Spray roasting pan with a cooking aerosol. Place tenderloins in spray coated pan. Place a meat thermometer into one tenderloin. Place carrots, potatoes and onions around tenderloins. Add oil evenly over meat and vegetables. Sprinkle over meat with rosemary, sage, parsley and pepper. Bake uncovered at 450°F for 30 or 40 minutes, or until thermometer reads 165°F and vegetables are tender. Preheat oven to 400 °F. Combine mustard, paprika, cumin and garlic in a large bowl and mix thoroughly. Add potatoes to bowl and toss until coated well with mustard mixture. 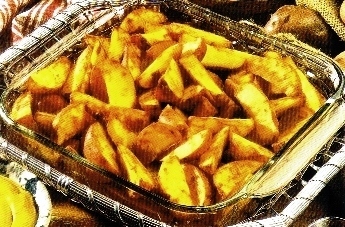 Bake potato wedges for 10 minutes or until tender and crusty. Place shrimp in a shallow dish. pepper and mix well everything. Side apart half of the mixture sauce. Pour remaining sauce over shrimp and marinate for 2 hours before cook. Cut zucchini into 1½ inch pieces. Drain shrimp and discard the marinate sauce. Broil brochettes, turning several times and basting with the reserved sauce for 6 minutes or until shrimp turn pink. Remove corn husks and skills, slice kernels of cobs to get 2 or 3 cups. Place kernels into a medium bowl. Scrape cobs with back of knife to release remaining juices. Preheat large sauté pan on medium-high 2 or 3 minutes. When hot, place oil in pan and add scallops. Cook 2 or 3 minutes on each side or until golden, opaque and firm. Remove pan from heat, transfer scallops to a plate and cover to maintain warm. Cut bacon into small pieces and add to the same pan and cook for 3 or 4 minutes or until crisp. Drain bacon fat, reserving one tablespoon in pan. Mix tomatoes, red bell pepper and onions and stir to the pan, cook this mix for 2 or 3 minutes or until soft. Add to pan the seasoning, half-and-half and corn. 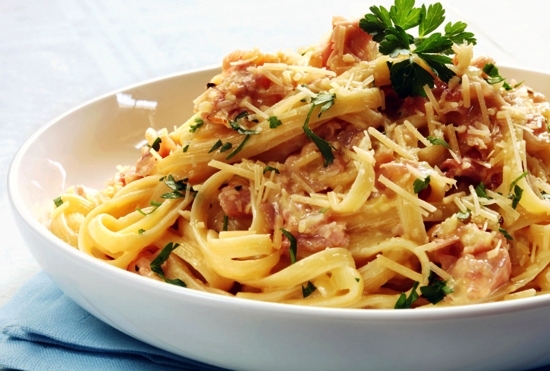 Reduce heat to medium-low and cook for 3 or 4 minutes, stirring frequently to prevent sticking. Transfer corn mixture to serving dish and top with scallops. Sprinkle over with the chopped chives.